If you are worried about your safety while traveling, it’s only right to include a first aid kit in the list of items you need to have in your car. 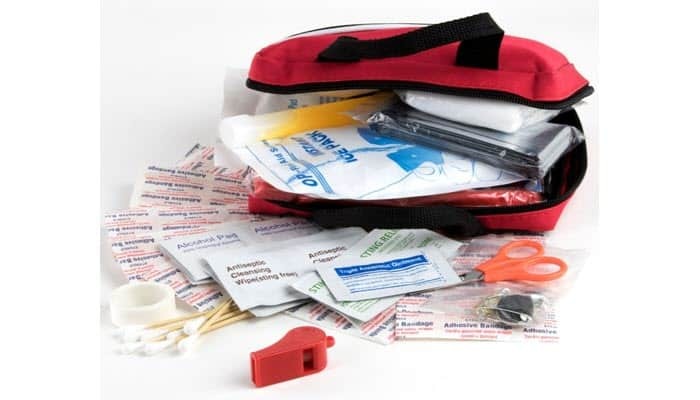 A good kit won’t only minimize injuries in case of emergencies and accidents but it can also save lives, especially since paramedics may not always arrive on time. 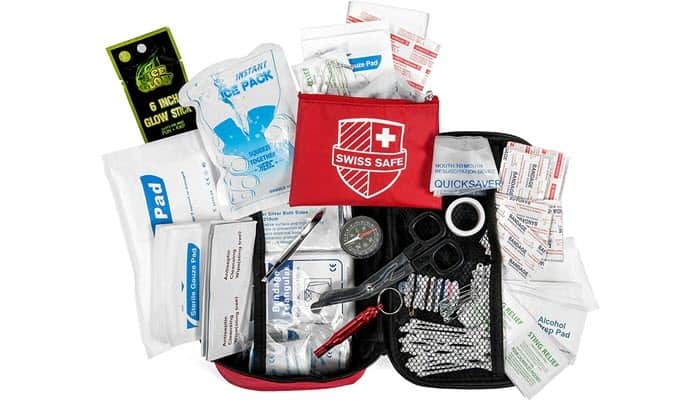 Swiss Safe 2-in-1 First Aid Kit comes with 32 first aid items. It’s complete with a trauma pad, emergency blanket, ice packs, gauze pads, sting relief pads, first aid tapes, elastic bandages, and even a CPR mask. And if you got lost, the kit also has a compass you can use. Seriously, it has almost everything you need to handle an emergency well. Apart from being fully stocked, the items are also intelligently organized. You won’t have a hard time locating where each piece is. You also won’t be confused as they are properly labeled. They are sealed as well to prevent contamination. Another thing that makes this kit our best first aid kit for cars is that it actually comes with a guide. It has an 18-page guide that’ll help you administer first aid properly. It will also help you with using the first aid items the correct way. Such guides are essential during an emergency since people’s first tendency is to panic. With a guide, you’ll be able to stay on track with what you have to do. The first aid bag measures 9 inches wide. It’s small enough to fit your car glove. Plus, it only weighs 1.2 pounds, allowing you to carry it with ease. 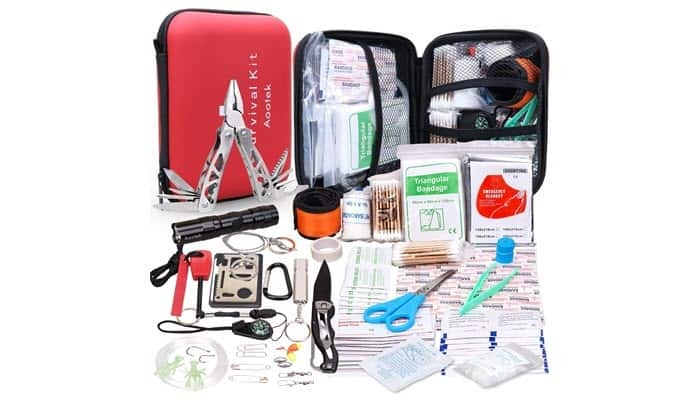 Aootek Upgraded First Aid Survival Kit, on the other hand, is more than just an emergency kit. It contains tools that can help you survive natural weather disasters, major emergencies, and situations that require immediate treatment and medical-grade supplies. This kit contains regular pliers, wire cutters and strippers, can opener, saw blade, needle nose pliers, and metal/wood file. Additionally, it also has fire starters, compass, whistle, flashlight, and knives. These tools are both reliable and durable. With proper care, you should be able to use them for a long time. One of the things you may not like about this kit is that it almost feels like refolding a map. If you need to use a specific item, you’ll need to take out a lot of things first. Getting the items back to their original spaces may also be challenging. Surviveware First Aid Kit looks really neat. It’s made of 600D polyester which makes it one of the strongest bags in its price range. It’s compact, portable, and lightweight which are exactly the things that made this kit stand out for us. And you know what the best part is? It actually comes with 600 basic life-saving items despite weighing only a pound. It’s small enough to fit in your vehicle’s glove box. And if you decide to wear it with your bag or belt, it comes with a strap you can actually use. The bag is waterproof both inside and out. It’s a really handy feature, particularly when you find yourself and your car caught in a flood. There’s no need to worry about the items getting wet and damaged. The kit has inner sleeves which are all properly labeled according to use and function. This makes it easier for you to access them during really stressful situations where you’d normally panic and have a hard time focusing. 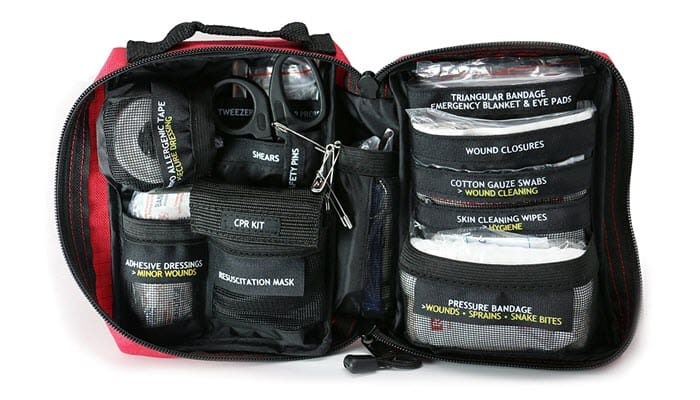 Tripworthy Compact First Aid Kit for Medical Emergency might be the cheapest one on this list but it doesn’t fall behind when it comes to features and quality. For one, it’s 2018 FDA approved which means that it’s designed with the highest standards and that everything inside was put together in a strictly FDA-approved facility. The kit has everything you need to take care of minor injuries. It also has survival items so you can have peace of mind whenever you are traveling alone or with your family. This kit has a portable design. It’s compact and travel-friendly so you won’t have a hard time using it in actual medical emergencies. It is water resistant and all of the items inside are carefully and properly wrapped in small ziplock bags. Since the plastics are clear, you’ll be able to see the items without the need to open each one up. Time is really critical during a medical emergency and paramedics may not always show up right away. Because of that, you need to find a kit that contains more supplies. That will ensure that you’ll have more of the things you need to survive for an extended period of time. Take note that while having more in your kit is good, you need to make sure that what you have in your kit are essential items only. For your car, you need a first aid kit that’s small and easy to carry. Huge comprehensive bags are generally heavier and are not always ideal. They are a better choice for home use since you won’t be carrying them around all the time. Consider your skills when looking for a first aid kit. Basically, what you want is a kit you can easily use, even if you don’t have medical skills or a lot of medical knowledge. For us, Swiss Safe 2-in-1 First Aid Kit is definitely the best first aid kit to have in your car. It has just the basic items you’ll need during an emergency. It even has a guide which is handy for people without extensive medical knowledge. Plus, it’s lightweight, compact, and super easy to transport in your car. Another great thing about the kit is that you can always upgrade it. You can add more items as you wish. Just make sure to not go overboard or else, you’ll end up crowding your kit. That can make it easy for you to find the items you need on time.